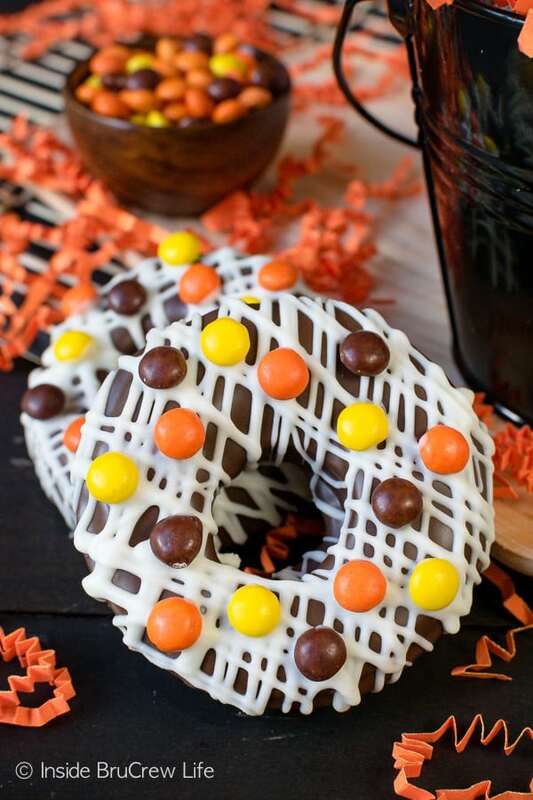 A chocolate coating and peanut butter filling add a fun flair to these Chocolate Covered Peanut Butter Apple Rings. 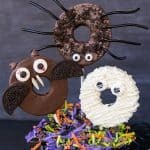 They make a fun and delicious no bake treat to share with family and friends. Use your extra bags of apples to make this easy Crock Pot Cinnamon Strawberry Applesauce this summer. It’s a delicious cool snack on a hot summer day. I have come to the conclusion that I should not attempt to care for live plants. My thumbs are seriously so black that I have killed multiple cactuses. Yes, plants that doesn’t need much water have died on my watch. Every year at this time, my family likes to buy me plants for Mother’s Day. Now most of the plants that we have put in the ground have survived because we used a sprinkler. Most of them lived that is. I actually did really well at keeping the plants we did in our backyard garden alive last year. The cactuses on the dining room shelf though didn’t have the same fate. And the herbs I purchased earlier this year for our kitchen window died a tragic death too. Every single time we have purchased live plants for the inside of our home, I have managed to kill them. I’m pretty sure plants know that they are going home to die when I pick them up because they seem to wilt when they walk through our door. Maybe I’m just imagining that though. All I know is that I should probably stick to buying fake plants and baking another Maple Apple Walnut Cake instead of gardening. I did find a few faux plants at Target that are actually look pretty life-like. At least from a distance anyway. If you or someone else you know are plant challenged like me, I have a fun solution for you. 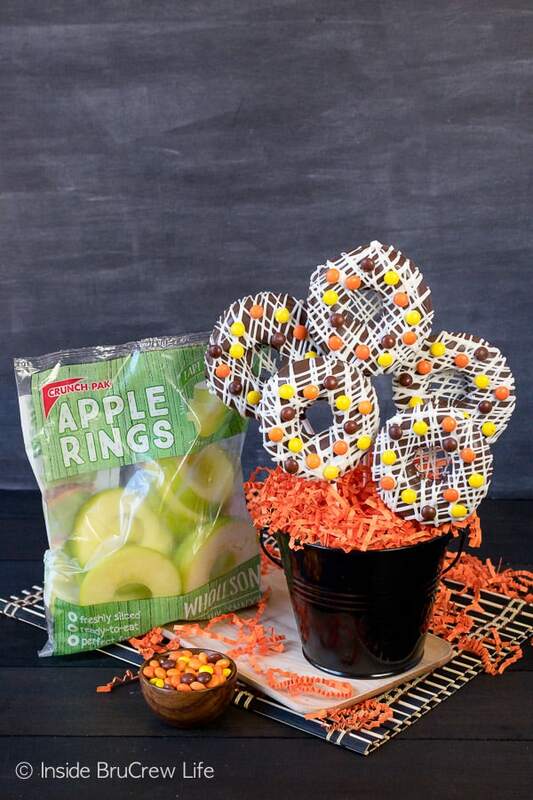 Instead of purchasing live plants for your friends or family, make them a delicious bouquet of Chocolate Covered Peanut Butter Apple Rings. One of my boys favorite treats are these Peanut Butter Balls. 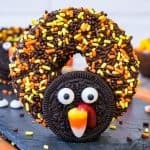 Over the past few years I have used that recipe in so many fun treats for Easter, Halloween, and Christmas. This year I wanted to include that recipe into a cute Mother’s Day treat. Enter in the flower bouquet made with apple rings. I absolutely love working with Crunch Pak apples. We love keeping bags of their pre-packaged apples in our fridge because they are the perfect grab and go snacks. Last fall they introduced apple rings into their product line too. 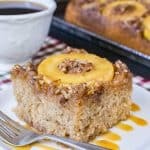 We like to spread peanut butter and granola on them for a healthy after school snack, but I also love to make this Apple Pecan Upside Down Cake for dessert with them. Open a bag of Crunch Pak Apple Rings and use the tip of a knife to make a small hole in the bottom of the rings. Press a cookie stick or wooden skewer into the ring, but do not go all the way through the center hole. Place the rings on a layer of paper towels because we want to remove the extra moisture. Place paper towels on top of the apple rings too. 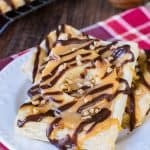 Make a batch of peanut butter filling and divide it into 12 even balls. Roll each ball into a small rope. Place the rope around the top of the apple rings and press it out evenly. Melt your chocolate according to the package directions. 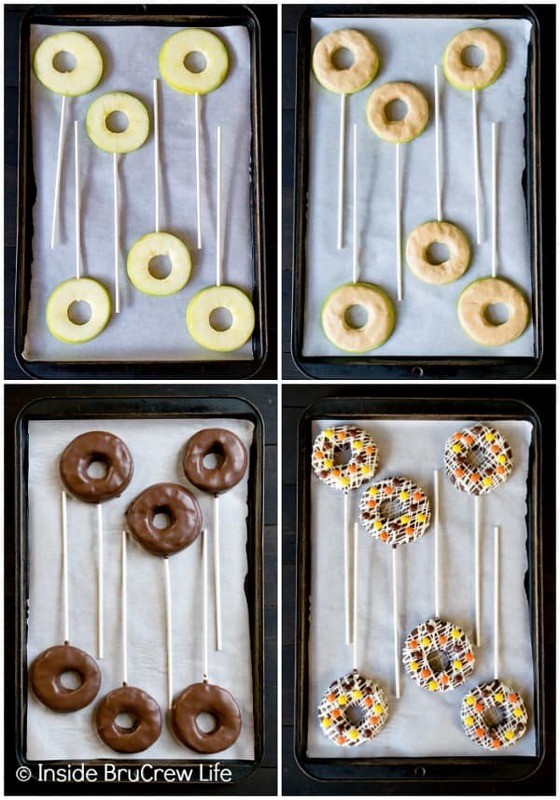 Dip the apple rings into the chocolate and use a spoon to cover the tops of the peanut butter filling. Tap the sticks very gently on the edge of the bowl to remove the excess chocolate. Place the apples on a parchment paper lined tray and let the chocolate set up. 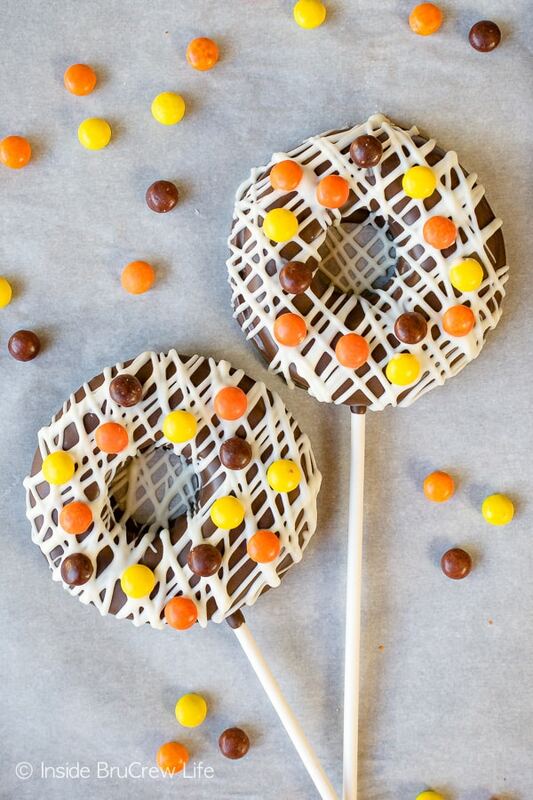 Drizzle the tops of the apple rings with white chocolate and press mini Reese’s Pieces into the wet chocolate. Let set again. Serve on a tray or press the sticks into a pot filled with styrofoam. 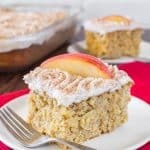 These are best served on the day you make them because of the moisture from the apples. 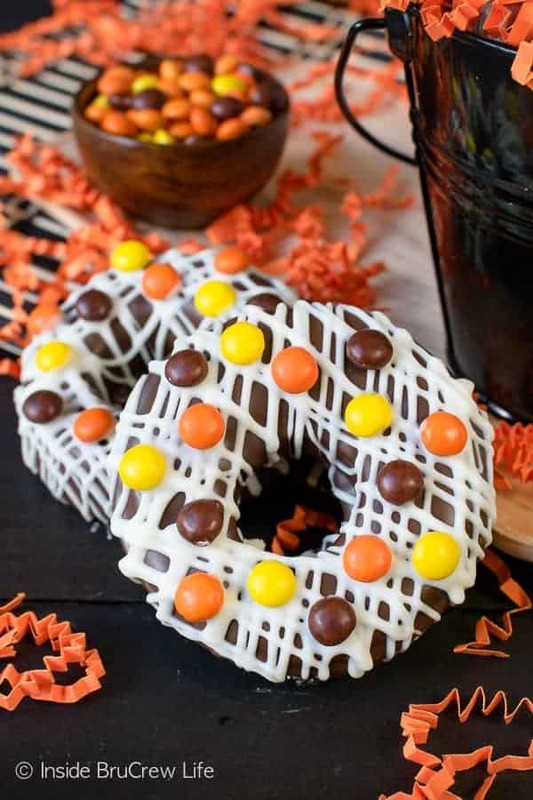 They can also be made without the sticks for a fun donut shaped apple dessert. 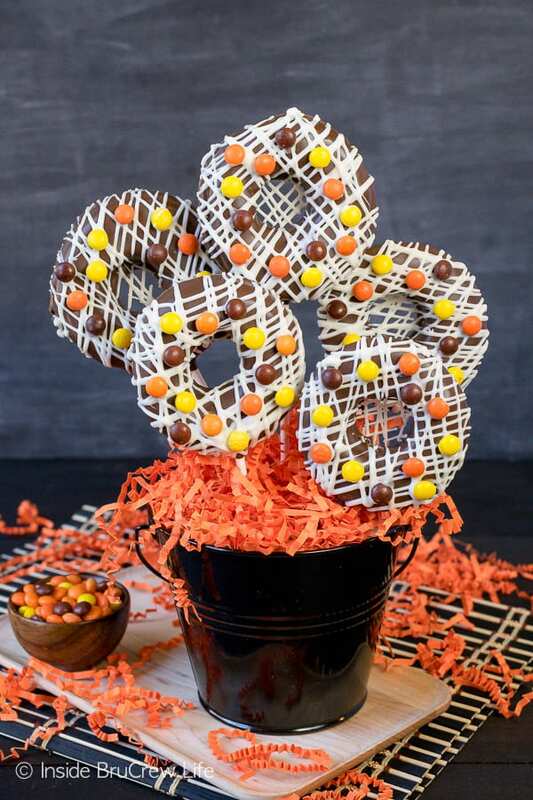 These Caramel Apple Ring Pops would be a fun treat to serve in a flower pot for Mother’s Day gifts. Drizzles of caramel and chocolate make these Caramel Apple Cheesecake Tarts a sweet dessert. Make mom a batch of these Apple Pancake Rings for a special breakfast. A scoop of ice cream on top of these Cinnamon Apple Puffs sounds like a great dessert treat. Melt the white chocolate according to the package directions. Spoon into a small plastic Ziplock bag and cut one corner off. Drizzle over the tops of the apple rings. Press the Reese's Pieces into the wet chocolate. Let set again. Place on a tray or press the sticks into a pot with styrofoam in it. Serve the same day for best results.